Not to be confused with: Town of Mount Charleston, Nevada. Mount Charleston, including Charleston Peak at 11,916 feet (3,632 m),  is the highest mountain in both the Spring Mountains and Clark County, in Nevada, United States. It is the eighth-highest mountain in the state. Well separated from higher peaks by large, low basins, Charleston Peak is the most topographically prominent peak in Nevada,  and the eighth-most-prominent peak in the contiguous United States. It is one of eight ultra-prominent peaks in Nevada. It is located about 35 miles (56 km) northwest of Las Vegas within the Mount Charleston Wilderness, which is within the Spring Mountains National Recreation Area of the Humboldt–Toiyabe National Forest. Mount Charleston is a year-round getaway for Las Vegas's residents and visitors, with a number of hiking trails and a modest ski area. The mountain, which is snow-capped more than half the year, can be seen from parts of the Las Vegas Strip when looking toward the west. 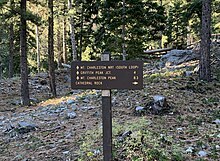 Mount Charleston has nearly 200 camp sites and over 150 picnic areas, some of which are RV-accessible. The village of Mount Charleston, Nevada, lies at its base to the east. Charleston Peak is a popular destination for hikers. The summit offers panoramic views from the Sierra Nevada, Death Valley, and Las Vegas. There are two well-marked and well-maintened trails to the summit: South Loop Trail and North Loop/Trail Canyon. The trails can be done on their own as an out-and-back hike, or combined as a loop. Both approaches involve a strenuous 16-mile+ round trip with over 4000 feet of climbing. The hike often takes all day. The hike is most accessible in the snow-free months of summer and fall. ^ a b "Charleston Peak, Nevada". Peakbagger.com. Retrieved 2008-04-02. ^ "Desert Peaks Section List" (PDF). Angeles Chapter, Sierra Club. Retrieved 2016-08-08. ^ "Great Basin Peaks List". Toiyabe Chapter, Sierra Club. Retrieved 2016-08-08. ^ "Charleston". NGS data sheet. U.S. National Geodetic Survey. Retrieved 2008-04-02. ^ "Charleston Peak". Geographic Names Information System. United States Geological Survey. Retrieved 2011-05-18. ^ "Nevada Charitable and Collegiate License Plates". Nevada Department of Motor Vehicles. Retrieved 2008-11-08. ^ Federal Writers' Project (1941). Origin of Place Names: Nevada (PDF). W.P.A. p. 14. ^ "Spring Mountains Visitor Gateway". Go Mt. Charleston. Retrieved 2018-12-28. ^ "Charleston Peak : Climbing, Hiking & Mountaineering : SummitPost". www.summitpost.org. Retrieved 2018-12-28. Wikimedia Commons has media related to Charleston Peak.